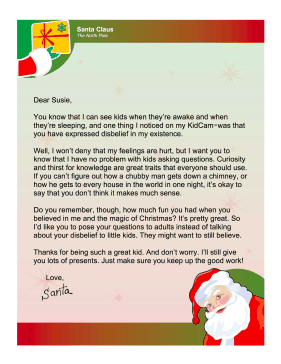 Meant for a child who is starting to believe that Santa Claus isn't real, this free, printable Christmas letter encourages kids to question adults and voice their concerns. You know that I can see kids when they're awake and when they're sleeping, and one thing I noticed on my KidCamTM was that you have expressed disbelief in my existence. Well, I won't deny that my feelings are hurt, but I want you to know that I have no problem with kids asking questions. Curiosity and thirst for knowledge are great traits that everyone should use. If you can't figure out how a chubby man gets down a chimney, or how he gets to every house in the world in one night, it's okay to say that you don't think it makes much sense. Do you remember, though, how much fun you had when you believed in me and the magic of Christmas? It's pretty great. So I'd like you to pose your questions to adults instead of talking about your disbelief to little kids. They might want to still believe. Thanks for being such a great kid. And don't worry. I'll still give you lots of presents. Just make sure you keep up the good work!